My older dog Linus was feeling disoriented, unbalanced and confused. 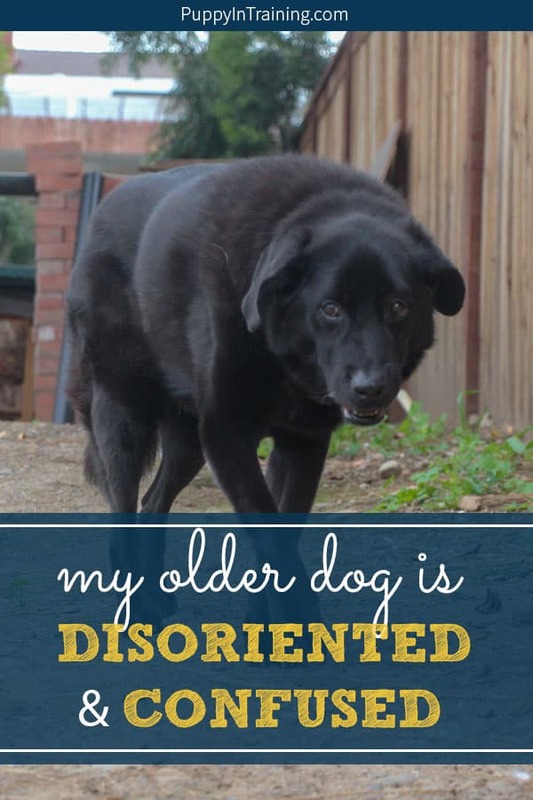 Is your older dog suddenly disoriented, unbalanced, and confused? A good friend of mine gave me a call today to wish me happy birthday. While catching up he told me about his thirteen year old German Shepherd. Apparently while he was on vacation in Hawaii his German Shepherd became quite ill.
Fortunately, their dog was diagnosed and treated for a disease know as Canine Vestibular Disease also known as Old Dog Vestibular Symptom. What is Canine Vestibular Disease? Some commons symptoms of this disease are leaning toward one side, shaking of the head, and walking around in circles. Vestibular means a problem with the connections between inner/middle ear and brain causing ataxia. Dogs with ataxia stand with their limbs braced, they walk with difficulty and have a “drunk” type of motion because they have lost their sense of balance. When the vestibular nerve, which travels from the inner ear to the brain, malfunctions. It disrupts the animal’s sense of balance and orientation. UPDATE AND RECOMMENDATION: Unfortunately, in his final days Linus was having trouble walking and the vet diagnosed him with vestibular disease. We never had the chance to use them, but two things we thought might help him were these Pawz Dog Booties to help him better grip our concrete floors and the Gingerlead so we could support him when he was trying to walk around. Read more about Linus in our updates below. Can My Dog Be Misdiagnosed? It has been suggested that there is a correlation between old dog vestibular syndrome and hypothyroidism so blood work should be done to rule out this problem. The ears should be thoroughly examined because the same symptoms can result from a severe ear mite infection. Also certain types of antibiotics such as streptomycin and gentomicin can cause vestibular syndrome. Please note that a serious inner/middle ear infection—which can occur without the customary smelly ear—has the same severe and frightening symptoms. Because of the sudden nature of this disease it can often be misdiagnosed as a stroke. As in the case of my friend’s dog after a couple weeks the animal learned to compensate for old dog vestibular syndrome and began moving around the house like a normal dog. 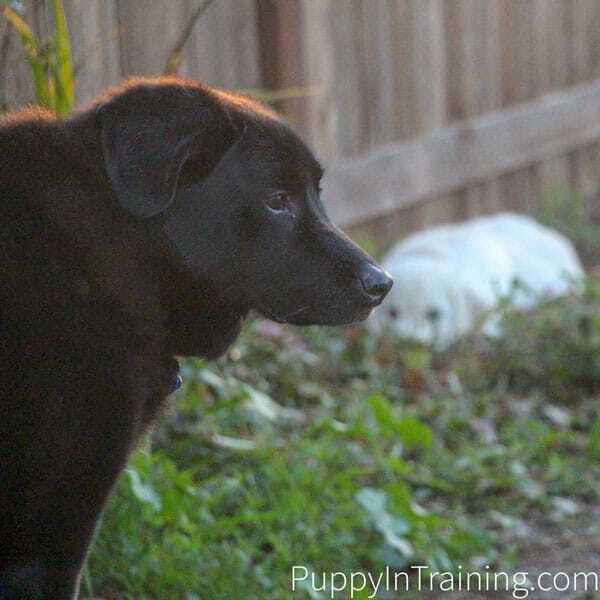 Try and keep your dogs feet firmly on the ground and eyes facing the horizon to help the dog gain his/her orientation. This disease is not fatal and recovery just requires patience and tender loving care. Back to my story…fortunately for my friend his dog received the proper diagnosis. After rushing back from Hawaii they noticed their dog’s head was cocked to the side, but after two weeks he was back to normal. Now that I think back to our old family dog, a lab border collie mix, I think that he may have suffered a similar affliction. We assumed he had a stroke (also the assumption of our vet) and he was disoriented, unbalanced, and confused. I’d love to hear what you have to say. Have you ever encountered this situation with your dog? 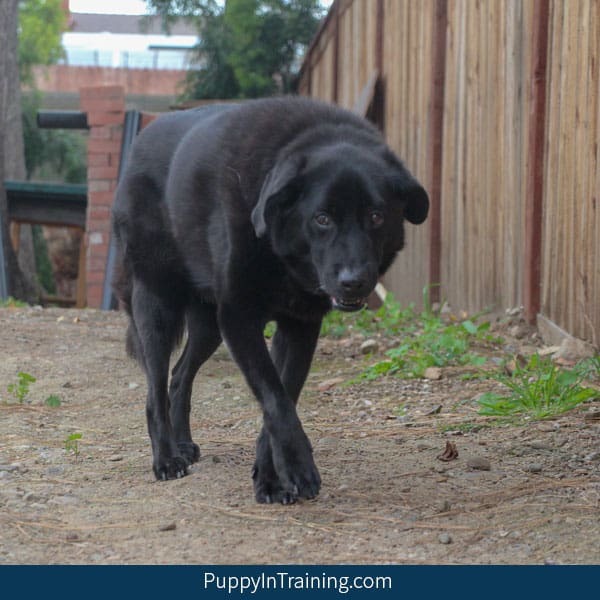 Is your dog currently experiencing being disoriented, unbalanced, and confused? If so, your dog may have Canine Vestibular Disease. Perhaps your dog is sick with other symptoms…if your dog is gagging and coughing then take a look at my article My Dog’s Got Kennel Cough…Now What? Fortunately my two dogs are four and two years old so hopefully I won’t have to deal with Canine Vestibular Disease any time soon (if at all). UPDATE: I can’t believe this was originally written when Linus was only 4 years old. My third dog is 1 years old and is in guide dog training (actually he’s technically not my dog he belongs to the guide dog school). UPDATE #1: I’m amazed how long I’ve been writing to this blog. My two dogs are now seniors at 11 and 13 years old! I’ve been fortunate that neither has yet to experience canine vestibular disease, but they are slowing down and not walking as gracefully as they once did. As I mentioned earlier the Gingerlead is something that would be very helpful if your dog is experiencing vestibular disease. UPDATE #2: I’m sad to say that at 13 1/2 years old Linus was diagnosed with congestive heart failure. Less than a week later he was diagnosed with canine vestibular disease. And a few short days after that he passed away. I’ll have some more detailed updates when the pain of his loss has lessened. When we came home one day our older dog, Linus was disoriented, unbalanced, and confused. Disclaimer: I am not a veterinarian and would advise that anytime you notice symptoms in your dogs health you should take him to your local veterinarian for treatment. I have 10 year old Maltese, I took him in last night because he was showing these sign, along with labored birthing. We found out that he was in cardiac arrest,which they were able to treat and that he has heart disease. He is on medication now for the remainder of his years. I thought he wouldn’t be disoriented, acting like he is trying to locate us, and walking in circles to the left once we got home, but he is still doing it. I was thinking he may of had a stroke too and we didn’t catch it with heart issue being the main concern. After reading these post I am feeling b e otter so when I call Monday for his follow ups I can have them check him for this as well. I am glad there are sites like this that help put us pet owners at ease. Ms were fast panting, disorientated, I could tell the room was spinning for him the way his eyes we’re rapidly moving left to right. No balance, and finally legs splayed out because he couldn’t stand up.. . After an examination he gave my dog a sedative which helped immensely. At the moment he’s back to normal, it took a few days but I’m pleased to say apart from clinging to me which I don’t mind, he’s eating walking and generally happy…..
My now 14 yr old kelpie cross had her first major vestibular episode 10 weeks ago and a seizure a few weeks later.. came out of the blue following cruciate repair 2 weeks before.. she recovered after intensive care and therapy and yesterday had her second vestibular episode and seemed to improve once steroids were give but today she has had another.. she is very frustrated and confused as to what is happening, unsettled and just trying to cope., no idea how many will come and how this will affect her life.. guess its day by day at the moment.. she is loved more than life itself and I am doing the very best for her that I can.. guess she will tell me when she has had enough.. hoping that day is later rather than sooner.. she is my world. .
Well, I thank you for this blog. I just let my dog out for her morning duties moments ago. I usually go back to sitting on the couch and wait for her to scratch lightly at the screen door. But about ten minutes pass, and nothing. I went outside and she wasn’t there! I searched the property but she was gone. I started scanning the street. Then I saw her trying to go into the house next door. Not understanding, I scolded her, but she didn’t acknowledge me, which was odd. So I yelled at her to come home as I walked toward her. She seemed confused. She began walking down the street in the opposite direction of home. She didn’t respond to my calls. In fact, she didn’t even acknowledge hearing me. I had to run to catch her as she was going further down the street now. I caught up to her. I’m confused. Yet and I spank her rear one tap, but she ignores this. Very unusual. I veered her toward the house (she doesn’t get what’s going on, didn’t seem to recognize me, and nips at me each time I veer her back on course) but she continues turning back toward the street. This continues all the way back to the house. Finally, she recognizes a piece of the yard and from there, she retraced her steps back to the house. But once she gets in front of the door, she looks confused again and starts walking backwards. Acting like she didn’t recognize where she’s at. I had to really coax her to get her to come back in. As soon as she comes in, she starts stumbling and walking drunk. I thought maybe she was having a sugar drop as she has diabetes, so I fed her. She stumbled about for about five minutes in total. After she ate, she couldn’t figure a way to get on the couch, so I lifted her up. She’s calm now and resting. I immediately turned to Google for answers. Your blog was the third site. This all just happened moments ago. I thought I’d share all the symptoms because of a symptom not really mentioned in the description of this or other sites, mainly that she didn’t seem to recognize where she was, or me. She’s fine now and seems to know where she’s at again and who I am as well. Thank you for having a place to share. I failed to mention that she’s a Bichon Fisher and that she’s 13 years old.